Since 1 January 2005 the Neujahrsmarathon in Zurich has started with the very first second of the New Year. This time a record of more than 600 runners participated during the night, an increase of more than 50% compared to previously. Runners came from 33 different nations from all over the world to take part in the marathon, half marathon and quarter marathon. Dirk Joos, a 29-year old German, won his first ever marathon victory, while in the women's marathon the first three runners all beat the course record, led home by 37-year old Swiss Astrid Mueller. Rising star Feyisa Lilesa won in a new course record ahead of compatriot Negari Getachew Terfa and beating defending champion Samuel Muturi Mugo into third writes Cyrille Cartier. Atsede Bayisa became the first foreign athlete to win the women's race. 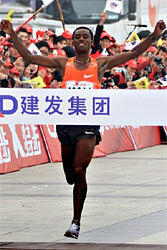 Lilesa, running only his second international marathon and his first in China, broke free of a tight-knit group at 38km. 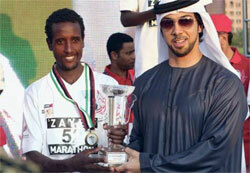 He beat Mugo's previous course record by four seconds, and his personal best by 25 seconds. About 50,000 runners from 32 countries participated in the 5km, 10km, half-marathon, and marathon in dry conditions at about 11°C. Ethiopian Berga Bekele and Kenyan David Kemboi Kiyeng paced together for most of the race. By 25km(1:16:30), the group was down to eight but it thinned further at 30km with Mugo, Terfa and Alemyehu Shumye one second ahead of Berga Bekele and Lilesa. By 35km Mugo, Terfa and Lilesa were away together, but at 38km Lilesa surged, leaving Mugo and in the 41st kilometre going ahead of Terfa. 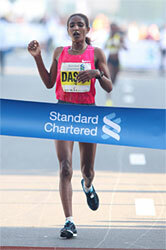 In the women's race Atsede Bayisa, Paris Marathon winner last year, foreged ahead for a 5-minute winning margin over Sun Juan. Bayisa, 22, was running unchallenged by 27km. Sun was a second behind Bayisa for the first half but fell six seconds behind by 25km and 50 seconds by 30km. Five kilometres later Bayisa had built a two-minute lead. In very hot weather 1300 people finished the 33rd edition of the Marathon, and 2000 the associated 10km event writes Chelsea McCullough. The champion from 2007 and runner-up last year, Leonard Muchera, bolted through halfway in a world record-pace 1:01:49 but could not maintain such a ferocious pace. He led to 34km but then faded to finish in 11th place, in 2:18:55. 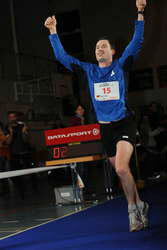 His halfway split is an Israeli all-comers record for the half marathon, but he started to slow after 30km. Running on a new course and on a relatively hot day, the defending champions were swept aside as new faces took over writes Ram Murali Krishnan. Last year's runner-up David Tarus led briefly but had problem in keeping contact as the group passed 11km. Pacemaker Simon Munyutu gave way at 15km leaving Simon Kasimli to lead compatriot Denis Ndiso and Ethiopians Gebo Burka and Haile Demissie at halfway, before dropping back. A second group included Kenyans Samson Limareng, Matthew Kibowen and Jonathan Kibet along with Ethiopians Siraj Amda Bene and Fekadu Kedir. As the runners approached the 4km-long newly opened Rajiv Gandhi Sea Link at 25km, only Ndiso and Burka were together and on the Sea Link, Ndiso kicked for home. He went on to record his first marathon win and a personal best as Amda Bene came from behind to take the second place. "I could have achieved better timing had there been cool weather," Ndiso said immediately after the race, adding that the last 5km was very hot. 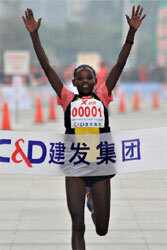 Ethiopian women ruled the roads of Mumbai for the third year in succession, filling the top-10 places. 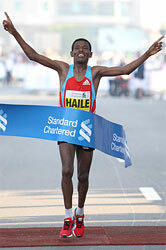 Three-time winner Mulu Seboka and defending champion Haile Kebebush led a group of dozen Ethiopian from the start. The women offered better hopes than men of a course record but the heat and humidity slowed them. The leading group included Bizunesh Mohammed Urgesa, the world junior silver medalist in 3000m in 2008,who held off the challenge from her senior compatriots and remained in the bunch throughout. Firehiwot Dado Tufa, last year's Rome Marathon champion along with Azalech Masresha made up a group of five as they approached half-way, but Seboka and Tufa tired as the heat took its toll. Bizunesh and Kebebush were running shoulder to shoulder in the final stages and Bizunesh left it to the last 200m before kicking ahead to reach the tape just two seconds ahead. 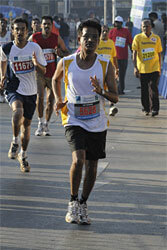 Bizunesh won the Eurasia Istanbul marathon last year, but set a personal best in Mumbai. 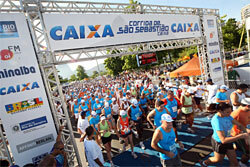 A Veterans' race, a 6km Dream Run a Wheelchair event and a half marathon were all held simultaneously with the Marathon. 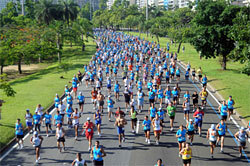 The Dream Run had 20,541 participants and included many Bollywood celebrities. Haile Gebrselassie won for the third time in a row again pocketing $250,000, the richest prize in road running writes Pat Butcher. A back problem had ruled out a world record attempt from the start, but when Chala Dechase and Eshetu Wendimu caught him in the final stages he had a real race on his hands. He drew on 20 years of experience to pull through to his eighth victory in 10 completed marathons, with an average time of 2:05:40, easily the most consistently marathoner ever. Dechase improved his personal best by two minutes, and Wendimu, repeating his third placing of last year, also ran two minutes faster. 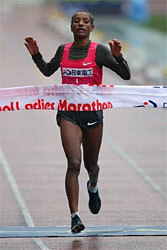 "When the pacemakers dropped at 30km I tried to go but I couldn't change gear" said Gebreselassie. "I waited for the second group, and just tried to win." The upset was reserved for the women's race, where Mametu Daska upset the favourites, Bezunesh Bekele and Askale Magarsa. A group of eight reached halfway together but then began to break up with only Daska, debutante Aberu Shewaye and last year's third placer, Helena Kirop, still left in contention at 35km. Kirop dropped back a kilometre later, and Daska and Shewaye continued their struggle until after 40km. Despite being violently sick in the finishing straight, Daska held onto the 50m lead she had forged in the last kilometre, to collapse across the finish line, in another personal best. Kirop was again third, also in a personal best. Conditions were better than expected, with the humidity dropping as the race progressed and the temperature only rising from 17-18°C between start and finish. With record participation of 6947 starters and 5941 finishers this year's race saw a course record in both the men's event and the women's, with husband-and-wife winners Erick Kibet and Joyce Chepkirui. 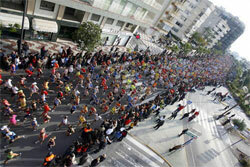 The organizers of this race, in a small tourist town of no more than 30,000 inhabitants close to Alicante, were more than happy with the success of the event, which returns better performances year by year. Surging away from Marisa Barros with less than 4km to go Amane Gobena scored Ethiopia's first ever victory in the race since it started in 1982 writes Ken Nakamura. 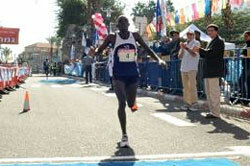 Gobena's previous best was 2:26:53 from the 2009 Los Angeles Marathon. Barros also recorded a personal best, while Mari Ozaki, running for the fourth time in this race, was third. "It was very fast from the start. I felt like running an ekiden," Ozaki said. "I was not watching the time though. Perhaps because of high pace at the beginning, I felt really cold in the later part of the race." Previous winner Lidia Simon fell back at 22km, but ran her own race to pick off runners and finish a very respectable fourth. In fifth Kayoko Obata, running the final marathon of her long career (26 starts with no DNFs), ran the fourth fastest time of her career. Debutantes Ryoko Kizaki and former cross country skier Azusa Noriji finished sixth and eighth. In cold conditions with and an occasional drizzle, the race started at 12:10 from Nagai stadium, the venue of 2007 IAAF World Championships. The first kilometre passed in 3:22, immediately reducing the lead group to about 13 runners. With the relatively fast pace the lead pack was reduced to nine before 10km (33:46) and by 15km (50:22) the lead pack of six started to stretch out. With pre-race favourite Yukiko Akaba still in front, the six reached halfway in 1:10:44, just 20 seconds behind record pace. Then Simon started to lose contact and soon after Kizaki also bagan to lag. Approaching 25km Barros began to drift behind but on the steep downhill near 26km, she went to the front followed by Gobena and Ozaki, while Akaba dropped to fourth. The gap gradually widened between Akaba and the three leaders. With Barros leading, three runners passed 30km in 1:40:57 after which Ozaki fell back. At 31km Kizaki caught Akaba, who looked like she was in pain, to move into fourth. Just before 39km Akaba's coach and husband pulled her out of the race. Under steady rain, the pace continued to slow. Barros and Gobena passed 35km in 1:58:08, followed by Ozaki 26 seconds later. Gobena took the lead at 38.5km, and the gap between her and Barros gradually widened. With an eight-second lead at 40km, the Ethiopian slowed considerably in the final stages but still took a convincing victory.